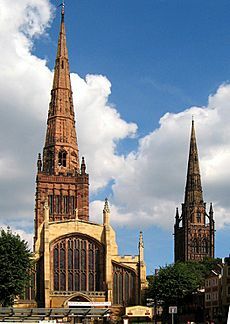 Coventry ( i/ˈkɒvəntri/) is a city and metropolitan borough in the West Midlands, England. 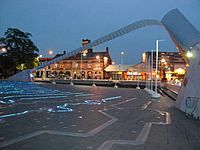 Coventry is 95 miles (153 km) northwest of central London, 19 miles (31 km) east-south-east of Birmingham, 24 miles (39 km) southwest of Leicester and 11 miles (18 km) north of Warwick. 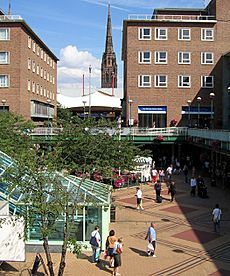 Coventry suffered severe bomb damage during the Second World War. There was a massive Luftwaffe air raid, part of the "Coventry Blitz", on 14 November 1940. 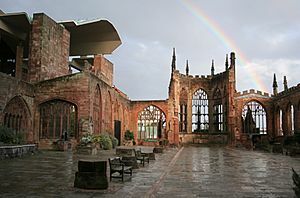 Firebombing on this date led to severe damage to large areas of the city centre and to Coventry's historic cathedral, leaving only a shell and the spire. More than 4,000 houses were damaged or destroyed, along with around three quarters of the city's industrial plants. More than 800 people were killed, with thousands injured and homeless. On the sporting scene, Coventry Rugby Football Club was consistently among the nation's leading rugby football sides from the early 20th century, peaking in the 1970s and 1980s with a host of major honours and international players.to the north of the city centre, in the Rowleys Green district. Since 2000, the city has also been home to one of the most successful Ice Hockey teams in the country, the Coventry Blaze who are four time Elite League champions. Ricoh Arena: located 3 1⁄2 miles (5.6 kilometres) north of the city centre, the 32,600 capacity Coventry City F.C. stadium is also used to hold major rock concerts for some of the world's biggest acts, including Oasis, Bon Jovi, Lady Gaga, Rod Stewart, Kings of Leon and the Red Hot Chili Peppers. It was also one of the venues chosen for the footballing events at the 2012 Olympic Games. 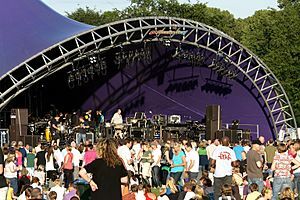 The adjacent Jaguar Exhibition Hall is a 6,000-seat events venue for hosting a multitude of other acts. Kasbah nightclub, Hillfields. It was renamed after refurbishment in 2007, but is still often referred to by its previous name, 'Colosseum'. By older Coventrians, it is still remembered as the Orchid Ballroom. 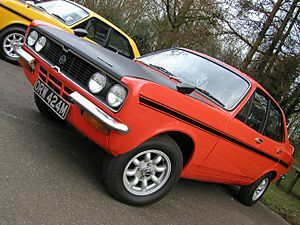 Notable Coventrian sportsmen include speedway rider Tom Farndon; Davis Cup tennis player Tony Mottram; footballers Kenneth Hegan, Reg Matthews, Bobby Gould, Graham Alexander, Gary McSheffrey and Callum Wilson; cricketers Tom Cartwright and Ian Bell MBE; rugby union players Ivor Preece, Keith Fairbrother, David Duckham MBE, Neil Back MBE, Danny Grewcock MBE, Geoff Evans, Andy Goode, Shane Geraghty and Tom Wood; motor-cyclist Cal Crutchlow; golfer Dame Laura Davies DBE; sprinter Marlon Devonish MBE; distance runners Brian Kilby and David Moorcroft OBE; darts player Steve Beaton. Origins: Coventry in a linguistic sense looks both ways, towards both the 'West' and 'East' Midlands. 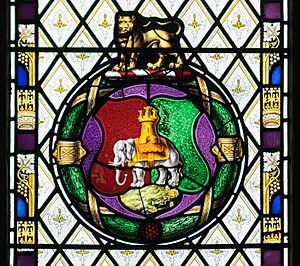 One thousand years ago, the extreme west of Warwickshire, what today we would designate Birmingham and the Black Country was then separated from Coventry and east Warwickshire by the forest of Arden, with resulting inferior means of communication. The west Warwickshire settlements too were smaller in comparison to Coventry which, by the 14th century, was England's third city. Even as far back as Anglo-Saxon times Coventry—situated as it was, close to Watling Street—was a trading and market post between King Alfred's Saxon Mercia and Danelaw England with a consequent merging of dialects. Coventry and Birmingham accents: Phonetically the accent of Coventry is similar to Northern English in that it does not have the trap-bath split, so cast is pronounced /kæst/ rather than /kɑːst/. Yet the clipped, flatter vowels in the accent also contain traces of Estuary English (T-glottaling), increasingly so amongst the young since 1950. 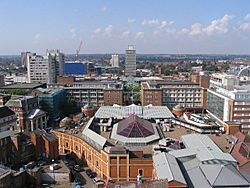 One notable feature which television producers have been apt to overlook is the distinction between Coventry and Birmingham accents. In Birmingham and the Black Country 'Old' and 'cold' may be pronounced as "owd" and "cowd", this linguistic feature stops starkly as one moves beyond Solihull in the general direction of Coventry, a possible approximation of the 'Arden Forest' divide perhaps. Yet accents alter briskly in this particular part of the Midlands, North Warwickshire (Bedworth & Nuneaton) displays increased East Midlands dialect features. Then again, just to the south, the general Southern English feature of the longer 'a' in words such as "bath" and "path" (becoming like the nonce words "barth" and "parth" as pronounced in a non-rhotic accent) starts to occur regardless of class or geodemographic grouping across an east to west band of settlements somewhere between Southam and Banbury, positioning Coventry right at the edge of England's phonetic crossroads. 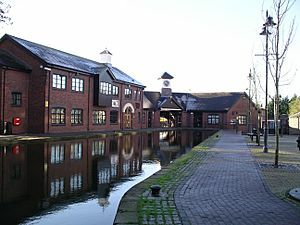 Coventry accent on television: Dramatic representations on film have been very uneven down the years, ranging from Yorkshire sounding builders visiting the Queen Vic in EastEnders  to Black Country sounding factory workers in the Jeffrey Archer adaptation 'First Among Equals' (1984). 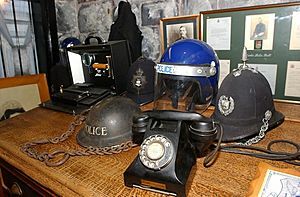 The BBC's 2009 documentary The Bombing of Coventry contained useful phonetic data on the 'Coventry Accent' in the form of interviews with Coventrians. A recent performance from the actress Becci Gemmell, playing Coventry character Joyce in the BBC drama Land Girls, also gave a more accurate phonetic representation of the accent. A minor planet 3009 Coventry discovered by Soviet astronomer Nikolai Stepanovich Chernykh in 1973 is named after the city. Coventry Facts for Kids. Kiddle Encyclopedia.